Well summer is well and truly here and we are well into our touring UK gigs with half a dozen events already under our belt it looks like 2010 is going to be a scorcher! Then it’s off to Norfolk to take part for the first time ever in the prestigious HOLT SUMMER ARTS FESTIVAL…..An internationally renowned event centred around the pretty North Norfolk village of Holt…..I’m really looking forward to that one! Other events include ‘Hot on the Streets’ in Leigh, an Italian themed weekend in Southend on Sea, a community arts event in Merthyr in South Wales……Oh yes and we are currently talking to the Liverpool BID Company about funding The James Carling Pavement Art Competition in September and the possibility of bringing over ‘Master Painter’ & Madonnari – Kurt Wenner, world class pavement artist and inventor of 3D pavement art techniques to Liverpool. Yippie!!! Oh yes and the FIFA World cup has just started but who cares about that? 14 Jun	This entry was published on June 14, 2010 at 12:00 pm. 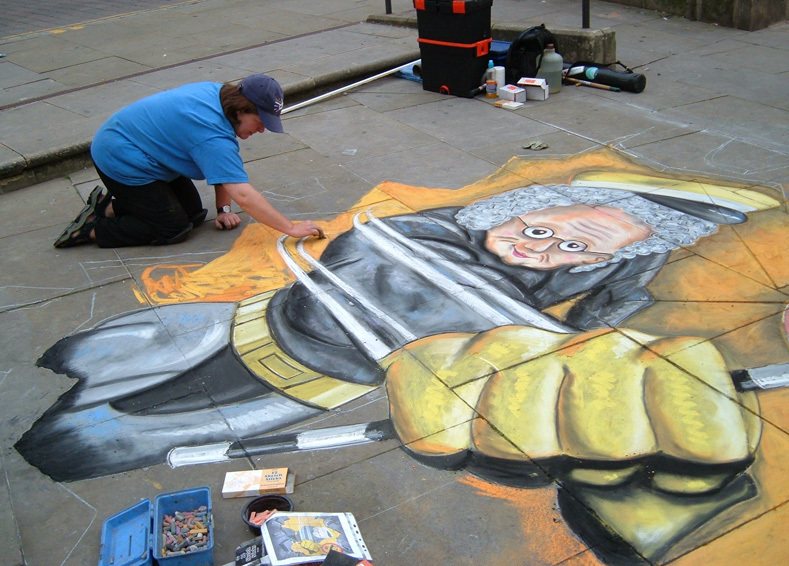 It’s filed under arts, culture, liverpool, street art and tagged 2010, art, artists, arts, battle, canvas, chalk, chalking, chalks, highlights, liverpool, painters, pavement, philip, sidewalk, street, urban, urbancanvas. Bookmark the permalink. Follow any comments here with the RSS feed for this post. Newer: The Poetry of Nature…….